This past Saturday was the Columbia area Cars and Coffee event and it was a bit wet. We got a steady drizzle all morning, but a few of the hard-core gear heads stuck it out to chat about cars. 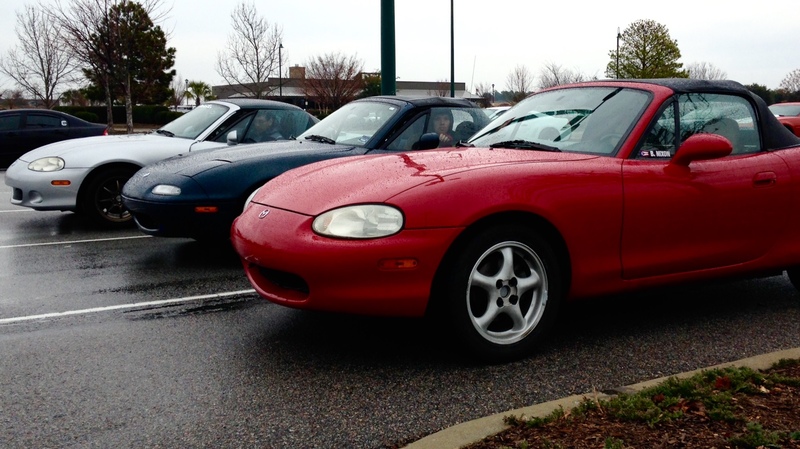 Friends of the blog, little Kyle and Harlan were there, so there were at least 3 Miatas. Nothing particularly caught my eye in the smaller than usual group. Better luck next month I suppose. The real bummer was the CEL came back on while driving home, so it looks like back to work on the EGR and intake to try and really clear it out. More to come on that. Hope everyone is keeping warm and dry and getting ready to have fun over the holidays! FIAT Abarth New Spark Plug Day! Car Show = Motor Trend Magazine! Here's My Christmas Wish List!